Tahitians are getting in on the act. More lustre. More colour. After sifting through nine lots of Tahitians of all shapes, sizes and colours, I, try the tenth and last, and it yields all the pearls I want, including some spectaular silver body and pink eye pearl pairs for studs, some more blues and a couple of huge drops. The blues of these blues hasn’t really come through in this photo but they are a lovely royal blue and will look stupendous with the paler blues I got yesterday. I think I am building a necklace. No more of those pink ones though.. 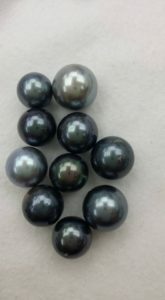 This entry was posted in Pearlescencery and tagged lustre, tahitian pearls, tahitians on September 12, 2016 by WendyG.